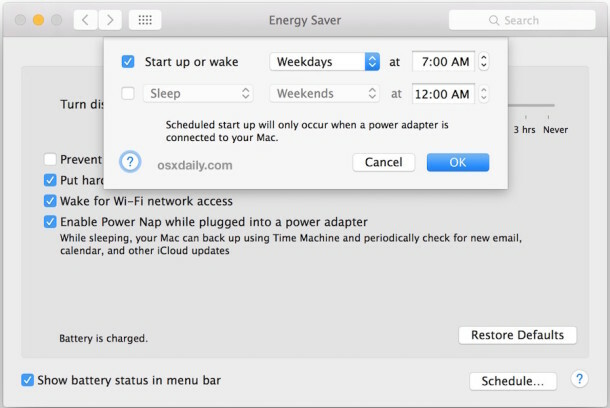 You can schedule your Mac to sleep, wake, shutdown, or boot up at any time or any regular interval using the OS X System Preference ‘Energy Saver’ schedule settings. This provides for an excellent option for work Macs that you want to be awake or boot when you arrive in the morning, and to sleep or shut down at a provided time when you leave in evening. Of course there are tons of other uses for the overlooked scheduling feature, so let’s learn how to set up this up. It’s necessary to adjust your sleep and wake events to fit what you want to accomplish and when, but this is an incredibly useful tip. 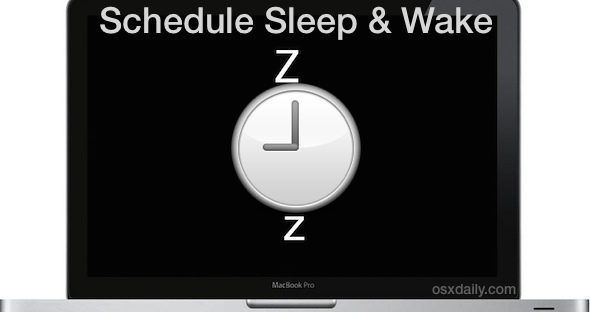 Now that you have this configured, your Mac will be scheduled to wake up, boot, shutdown, go to sleep, at whatever times you set! This is really handy to setup so that your Mac will be up and waiting for you before you arrive to your workstation, and also so that it will sleep through the night and conserve power. Setting sleep and wake schedules like this along with a Time Machine schedule is particularly worthwhile so that a backup completes and then the Mac can either turn itself off or go to sleep when finished. Or, if you schedule system startup and the Mac to shut down on a regular schedule, you can combine that with launching Mac apps on boot up in OS X so that your applications are waiting for you when you return to the Mac. This is an very handy feature with a lot of possibilities, try it out for yourself, and if you have a great use for power scheduling, share it with us in the comments. Any idea how to disable the scheduled sleep warning that appears about 2 minutes before the computer is scheduled to go to sleep? I’m creating a kiosk and the client would like to put the box to sleep or shut down at night and wake it up the next morning. But, we don’t want to give any users the option to disable this. As it is, a notice pops us about 2 minutes before scheduled sleep or shutdown. Any idea how to disable this?